The Pebble smartwatch is a Kickstarter success story, gathering thousands of likes and more importantly millions of dollars to kick off the project. Sadly, as most Kickstarter projects it has now been delayed a couple of times and there is no fixed release date. 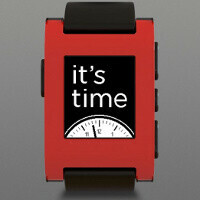 That is likely to finally change as the Pebble team is gearing up to name the release date at CES on January 9th, 2013. Pebble had 68,000 backers who have pledged $100 or more to the project, granting them a smartwatch. Luckily, despite the slight delays, the team is constantly keeping backers in the know about its progress, so there are no surprises. What makes Pebble different is the fact that it not only connect to your smartphone via Bluetooth, but also features an e-ink display for lower power consumption and good visibility even under direct sunlight. and what about i'm watch? I wouldn't buy anything that had an "i" at the beginning. apple doesnt have anything to do with i'm watch. its i'm not i. Still. It's a lousy marketing name. I'm watch is a good watch to compete with Sony's smartwatch. It has lots of feature but it uses android as its base. The watch lags and not responsive at times. But it is a good start. I'd really like to see this Pebble watch come into the market..
Perhaps if Sony released an updated version of the watch people may look at it again. I think the attention the Pebble is getting is due to the design as well as just the graphical layout of the watch (people like simplistic designs). It also is somewhat customizable and it apparently will have it's own app store which is kind of nice. As much as I like Sony's idea, when you think about day to day usage, the Pebble has more advantages. I do not need a color screen on my watch, I would rather have a low power continuously ON screen showing me the time for A WEEK without needing recharge. Sony failed in the execution with many people complaining on battery, constant connection drops and unreliability. I am waiting for Sony's Odin or Yuga... depending on 3G bands and I will match it with a Pebble later on =) Also, the pebble was made waterproof. The design of Sony's version is not good for me. Pebble has better. I'm watch is good also however its too expensive.